The AGO G5 kit features an advanced vaporizing system capable of heating dry leaves on-the-go. 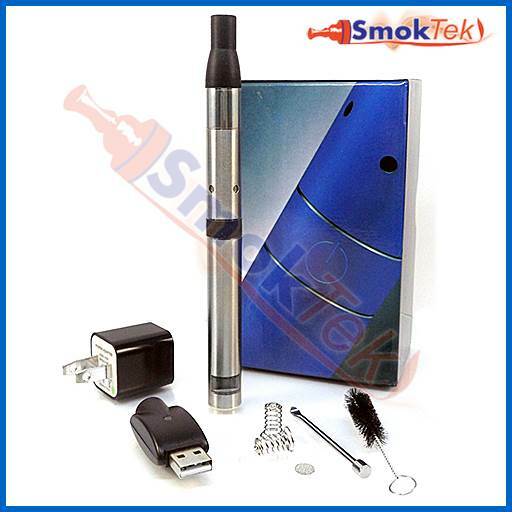 The kit includes a 650mAh eGo battery with 5-click On/Off manual operation, 510 threading, a recessed fire button with a blue LED ring and a LCD screen which indicates remaining battery life. Other features include a ceramic heating chamber and mesh filter and screen to prevent the leaves from burning. The AGO G5 is easy to use: simply remove the chamber connector from the ceramic heating chamber, use the included packing tool to fill with leaves, screw the chamber connector back on and you are ready to vape! Please note that while the mesh filter is pre-installed on the device, the mesh screen included with each unit is not - please place the mesh screen over the heating element inside the heating chamber before use to prevent your leaves from burning! To charge the battery, simply unscrew the heating chamber, screw onto the USB charger and plug into any USB port. Alternatively, attach the USB charger to the wall adapter and plug into a wall outlet. For a full charge, charge for 2 hours - once the battery is fully charged, the LED light on the USB charger will turn GREEN. The AGO G5 Dry Herb Vaporizer Kit is available in black, stainless, blue, red and green.